At some point in the next 10 years, there will be a huge fight in the United States over fiscal policy. This battle is inevitable because politicians are violating the Golden Rule of fiscal policy by allowing government spending to grow faster than the private sector (exacerbated by the recent budget deal), leading to ever-larger budget deficits. I’m more sanguine about red ink than most people. After all, deficits and debt are merely symptoms. The real problem is excessive government spending. But when peacetime, non-recessionary deficits climb above $1 trillion, the political pressure to adopt some sort of “austerity” package will become enormous. What’s critical to understand, however, is that not all forms of austerity are created equal. The crowd in Washington reflexively will assert that higher taxes are necessary and desirable. People like me will respond by explaining that the real problem is entitlements and that we need structural reform of programs such as Medicaid and Medicare. Moreover, I will point out that higher taxes most likely will simply trigger and enable additional spending. And I will warn that tax increases will undermine economic performance. 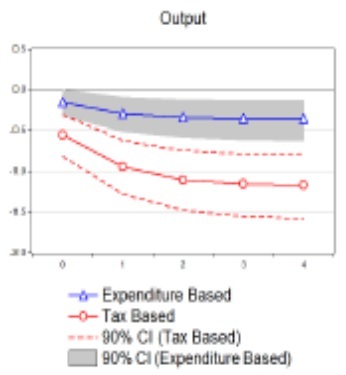 Regarding that last point, three professors, led by Alberto Alesina at Harvard, have unveiled some new research looking at the economic impact of expenditure-based austerity compared to tax-based austerity. …we started from detailed information on the consolidations implemented by 16 OECD countries between 1978 and 2014. …we group measures in just two broad categories: spending, g, and taxes, t. …We distinguish fiscal plans between those that are expenditure based (EB) and those that are tax based (TB)… Measuring the macroeconomic impact of a plan requires modelling the relationship between plans and macroeconomic variables. Here are their econometric results. There is a large and statistically significant difference between the effects on output of EB and TB austerity. EB fiscal consolidations have, on average, been associated with a very small downturn in output growth: a spending based plan worth one percent of GDP implies a loss of about half of a percentage point relative to the average GDP growth of the country, which lasts less than two year. Moreover, if an EB austerity plan is launched when the economy is not in a recession, the output costs are zero on average. …On the other hand TB plans are associated with large and long lasting recessions. A TB plan worth one per cent of GDP is followed, on average, by a two percent fall in GDP relative to its pre-austerity path. This large recessionary effect lasts several years. Here’s a chart from the study showing that economic performance drops farther and farther to the extent taxes are part of an austerity package. …investment growth responds very differently following the introduction of the two types of austerity plans. It responds positively to EB plans and negatively to TB plans. …in their sample of OECD countries, business confidence increases immediately at the start of an EB consolidation plan, much more so that at the beginning of a TB plan. 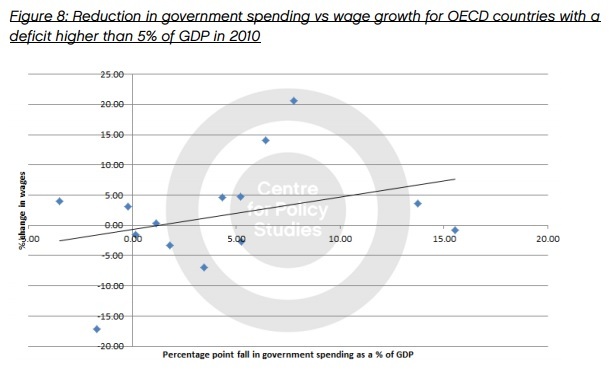 …and why tax-based austerity packages are bad for labor. …clearly tax hikes and spending cuts – beyond other effects – have different effects on labor supply. …EB plans are the least recessionary the longer lived is the reduction in government spending. Symmetrically, TB plans are more recessionary the longer lasting is the increase in the tax burden and thus in distortions. Since capital and labor are the two factors of production, the obvious and inevitable conclusion is that the economy does worse when taxes are higher. The study also make a critical point about the futility of tax increases when the burden of government spending is rising faster than the private sector. Simply stated, that’s a recipe for ever-increasing taxes, sort of like a dog chasing its tail. …a TB plan which does not address the automatic growth of entitlements and other spending programs which grow over time if much less like likely to produce a long lasting effect on the budget. If the automatic increase of spending is not addressed, taxes will have to be continually increased to cover the increase in outlays. That’s why spending restraint is the only way to successfully address red ink. It doesn’t even require dramatic spending cuts, even though that would be desirable. All that’s needed is some modest fiscal restraint so that spending grows slower than the productive sector of the economy. Nations that follow this approach for a multi-year period always get good results. But if you want examples of nations that have achieved good outcomes with tax increases, you’ll have to explore a parallel universe because there aren’t any on this planet. P.S. 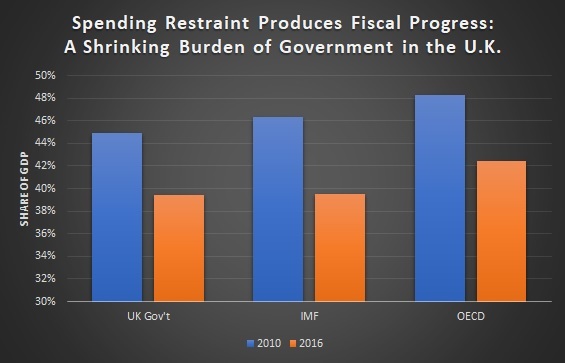 I need to update the table because both the United States (between 2009-2014) and the United Kingdom (between 2010-2016) enjoyed dramatic improvements in fiscal outcomes in recent years because of spending restraint. P.P.S. Politicians don’t like spending restraint, which is why most periods of good fiscal policy come to an end. To achieve good long-run outcomes, some sort of constitutional spending cap is probably necessary. P.P.P.S. The study cited above builds upon research I cited in 2016. 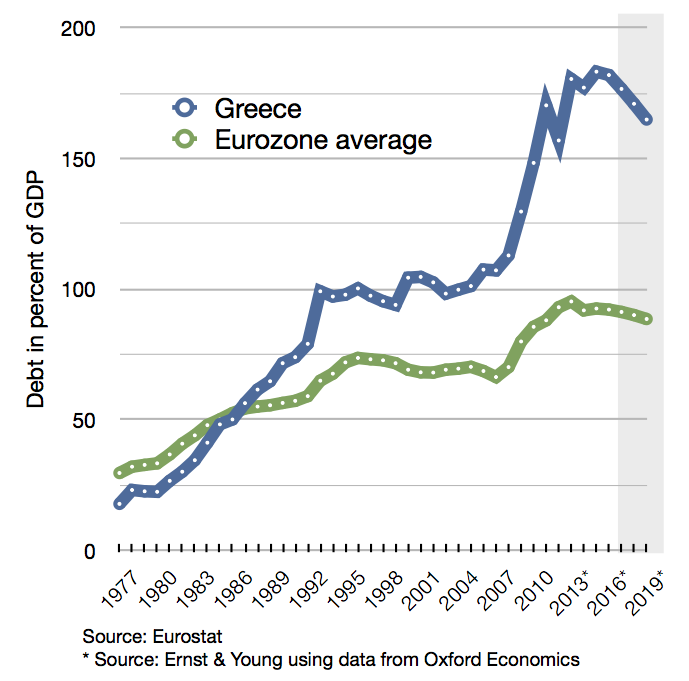 I wrote last month that the debt burden in Greece doesn’t preclude economic recovery. 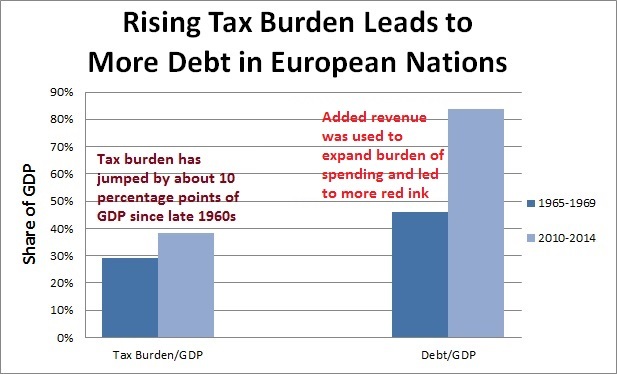 After all, both the United States and (especially) the United Kingdom had enormous debt burdens after World War II, yet those record levels of red ink didn’t prevent growth. Climbing out of the debt hole didn’t require anything miraculous. Neither the United States nor the United Kingdom had great economic policy during the post-war decades. They didn’t even comply with Mitchell’s Golden Rule on spending. But both nations managed to at least shrink the relative burden of debt by having the private sector grow faster than red ink. And the recipe for that is very simple. …all that’s needed is a semi-sincere effort to avoid big deficits, combined with a semi-decent amount of economic growth. Which is an apt description of…policy between WWII and the 1970s. Greece could achieve that goal, particularly if politicians would allow faster growth. The government could reduce red tape, which would be a good start since the nation ranks a miserable #114 for regulation in Economic Freedom of the World. But Greece also should try to reverse some of the economy-stifling tax increases that have been imposed in recent years. That may seem a challenge considering the level of red ink, but good tax policy would be possible if the Greek government was more aggressive about reducing the burden of government spending. And if that’s the goal, then the Baltic nations are a good role model, as explained by Anders Aslund in the Berlin Policy Journal. With Latvia being the star pupil. …austerity policies have not been attempted most aggressively in Greece: all three Baltic countries pursued more aggressive fiscal adjustments, especially Latvia. The Latvian government faced the global financial crisis head-on. …The Latvian government carried out a fiscal adjustment of 8.8 percent of GDP in 2009 and 5.9 percent of GDP in 2010, amounting to a fiscal adjustment of 14.7 percent of GDP over the course of two years, totaling 17.5 percent of GDP over four years, according to IMF calculations. Greece did the opposite. According to the IMF, its fiscal adjustment in the initial crisis year of 2010 was a paltry 2.5 percent of GDP, and in 2011 only 4.1 percent, a total of only 6.6 percent of GDP over two years. 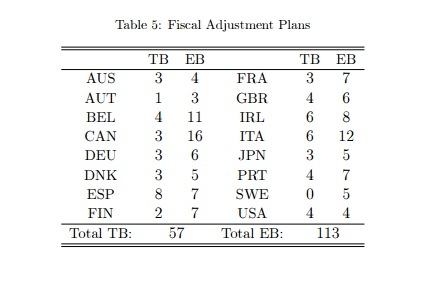 Greece’s total fiscal adjustment over four years was only 11.1 percent of GDP. In other words, Latvia (like the other Baltic nations) did more reform and did it faster. And it’s also worth noting that the reforms were generally the right kind of austerity, meaning that expenditure commitments were reduced. Whereas Greece has implemented some expenditure reforms, but has relied far more on tax increases. Better policy, not surprisingly, meant better results. In 2008-10 Latvia suffered an output decline of 24 percent, as much as Greece did in the six-year span from 2009-14. However, thanks to its front-loaded fiscal adjustment, Latvia was able to restore its public finances after two years. The country has shown solid economic growth, averaging 4.3 percent per year from 2011-14, according to Eurostat. …The consequences of tepid Greek fiscal stabilization have been a devastating six years of declining output, even as the Latvian economy has revived. In 2013 Latvia’s GDP at constant prices was 4 percent lower than in 2008, while Greece’s was 23 percent less than in 2008, according to the IMF. A cumulative difference in GDP development of 19 percentage points over six years cannot be a statistical blip – it is real. The bottom line is that Latvia and the other Baltics were willing to endure more short-term pain in order to achieve a quicker economic rebound. That was a wise choice, particularly since the alternative, as we see in Greece, is seemingly permanent stagnation. Anders Paalzow of the Stockholm School of Economics in Riga also suggests, in a recent article in Foreign Affairs, that Latvia is a good role model. Professor Paalzow starts by explaining that Latvia is now enjoying good growth after enduring a dramatic boom-bust cycle last decade. In 2008, Europe’s most overheated economy, which had been fuelled by cheap credit and rapidly raising wages and real estate prices, collapsed. GDP dropped by 20 percent and unemployment rose to more than 20 percent. But here’s where things take an unexpected turn. By late 2010, the first glimmers of recovery became apparent. Today, the economy is among Europe’s fastest growing, and its GDP is back at pre-crisis levels. So how did Latvia, the hero of this story, do it? …the Latvian government’s only real option was fiscal policy adjustment, the details of which it unveiled in its supplementary budget for 2009 and its budget for 2010. Both of these saw substantial reductions in social benefits accompanied by long overdue cuts in public employment with close to 30 percent of civil servants laid off. Those who remained in the public sector saw their salaries cut by 25 percent, on average, whereas salaries in the private sector fell by on average ten percent. …the reductions made during the crisis years amounted to approximately 11 percent of GDP. Most of the fiscal consolidation was done on the expenditure side of the public budget… The fiscal consolidation program continued into 2011 and the years following, even though the economy started to grow again. Not only did the economy grow, but the government was rewarded for making tough choices. …in 2010, the government responsible for austerity was reelected. But here’s the challenge. Professor Paalzow warns that fiscal reforms won’t mean much unless the chronic dysfunction of the Greek government is somehow addressed. The importance of the institutional framework cannot be overestimated. …it seems like a fool’s errand to try to sell off the public assets of a country riddled with high corruption… Furthermore, with a legal system incapable of enforcing current legislation and characterized by slow judicial processes, inefficient courts, and weak investor protection, legal reform will be a necessary condition for an economic turnaround. So he suggests that Latvian-type fiscal reforms should be accompanied by Nordic-style institutional reforms. Greece should look further north to Finland and Sweden, which overcame their own crises in the early 1990s. …The three to four years following the initial economic disaster saw remarkable institutional reform…substantial changes in both welfare systems. …both countries pursued austerity…, a remedy that both nations had frequently tried in the 1970s and 1980s without any success. What made the difference this time was that the institutional, and hence the fundamental roots, of the problems were addressed. While I like his prescription, I suspect Paalzow is being too optimistic. You can’t turn the Greeks into Finns or Swedes, at least not without some sort of massive jolt. Which is why my preferred policy is to end bailouts, even if it means that Greece repudiates its existing debt. If the Greeks no longer got any handouts, that necessarily would mean an immediate end to deficit spending (assuming the government doesn’t ditch the euro in order to finance spending by printing drachmas). And that might be a very sobering experience that would teach the Greek people about the dangers of having too many people trying to ride in the wagon of government dependency. That might not turn the Greeks into Nordics, but it presumably would help them understand that you can’t (at least in the long run) consume more than you produce. That’s also a lesson that some American politicians need to learn! P.S. I wonder if Paul Krugman will attack Latvia’s good reforms. When he went after Estonia for adopting similar policies, he wound up with egg on his face. The conventional wisdom, pushed by the IMF and others, is that Greece’s economy will never recover unless there is substantial debt relief. Translated into English, that means the Greek government should be allowed to break the contracts it made with the people and institutions that lent money to Greece. That may mean a “haircut,” which would mean lenders (often called creditors) only get back some of what they’ve been promised, or a “default,” which would mean they get none of the money they were promised. I wouldn’t be surprised if Greece has a full or partial default. And that actually might not be a bad result if it meant an end to bailouts and Greece was immediately forced to balance its budget. But let’s set that issue aside and look at the specific issue of whether Greece’s debt is unsustainable. Here’s a look at Greek government debt, measured as a share of economic output. As you can see, when the crisis started in Greece, government debt was about 100 percent of GDP. Was Greece doomed at that point? Well, if the situation was hopeless, then someone needs to explain why the United States didn’t collapse after World War II. As you can see from this chart, debt climbed to more than 100 percent of economic output because of the heavy expense of defeating Nazi Germany and Imperial Japan. Yet the American economy rebounded after the war (notwithstanding dire predictions from Keynesians) and the debt burden shrank. So maybe the more interesting issue is to look at how America reduced its debt burden after 1945, which may give us some insights into what should happen (or should have happened) in Greece. Here’s one question to consider: Did the burden of the federal debt drop between the end of World War II and the 1970s because of big budget surpluses? Nope. If you look at Table 7.1 of OMB’s Historical Tables, you’ll see that there was a steady increase in the amount of government debt in America after 1945. Yes, there were a few years with budget surpluses, but those surpluses were more than offset by years with budget deficits. The reason that the national debt shrank as a share of economic output was completely the result of the economy growing faster than the debt. Here’s an analogy. Imagine you graduate from college and you have $20,000 of credit card debt. That might be a very big burden relative to your income. But in your 50s and (hopefully) earning a lot more money, you might have $40,000 of credit card debt, yet be in a much stronger financial position. So the real issue for Greece (and Spain, and Japan, and the United States, etc) is not so much whether the amount of debt shrinks. It’s whether debt is constrained compared to private-sector growth. That doesn’t require any sort of miracle. Yes, it would be nice if Greece and other nations decided to become like Hong Kong and Singapore, high-growth economies thanks to small government and non-interventionism. But all that’s needed is a semi-sincere effort to avoid big deficits, combined with a semi-decent amount of economic growth. Which is an apt description of U.S. policy between WWII and the 1970s. Is it unreasonable to ask Greece to follow that model? Some may say Greece is now in a different situation because debt levels have climbed too high. Debt in the United States peaked a bit above 100 percent of GDP at the end of World War II, whereas government debt in Greece is now closer to 200 percent of GDP. It’s certainly true that today’s debt burden in Greece is higher than America’s post-WWII debt burden. So let’s look at another example. Government debt in the United Kingdom jumped to almost 250 percent of economic output by the end of the World War II. Did that cause the U.K. economy to collapse? Did Britain have to default? The United Kingdom simply did what America did. It combined a semi-sincere effort to avoid big deficits with a semi-decent amount of economic growth. And the result, as you can see from the above graph, is that debt fell sharply as a share of GDP. In other words, Greece can fulfill its promises and pay its bills. And the recipe isn’t that difficult. Simply impose a modest bit of spending restraint and enact a modest amount of pro-growth reforms. Unfortunately, prior bailouts have given Greece an excuse to avoid reforms. Though the IMF, ECB and European Commission (the so-called troika) have learned somewhat from those mistakes and are now making greater demands of the Greek government as a condition of another bailout. The problem is the troika doesn’t seem to understand what’s really needed in Greece. They’re pushing for lots of tax increases, which will make it hard for Greece’s private sector to generate growth. The only good news (or, to be more accurate, less bad news) is that the troika doesn’t want as many tax hikes as the Greek government would like. In other words, don’t be too optimistic about the long-run outcome. Which is basically what I said in this interview on Canadian TV. The bottom line is that a rescue of the Greek economy is possible. But so long as nobody with any power wants to make the right kind of reforms, don’t hold your breath waiting for good results. It’s remarkable to read that European politicians are agitating to spend more money, supposedly to make up for “spending cuts” and austerity. To put it mildly, their Keynesian-based arguments reflect a reality-optional understanding of recent fiscal policy on the other side of the Atlantic. Here’s some of what Leonid Bershidsky wrote for Bloomberg. Just as France’s and Italy’s poor economic results prompt the leaders of the euro area’s second and third biggest economies to step up their fight against fiscal austerity, it might be appropriate to ask whether they even know what that is. An excellent question. As I’ve already explained, austerity is a catch-all phrase that includes bad policy (higher taxes) and good policy (spending restraint). But with a few notable exceptions, European nations have been choosing the wrong kind of austerity (even though Paul Krugman doesn’t seem to know the difference). As a result, the real problem of bloated government keeps getting worse. Government spending in the European Union, and in the euro zone in particular, is now significantly higher than before the 2008 financial crisis. …Among the 28 EU members, public spending reached 49 percent of gross domestic product in 2013, 3.5 percentage points more than in 2007. Here’s a chart showing how the burden of government spending has become more onerous since 2007. As you can see, all the big nations of Western Europe have moved in the wrong direction. Only a small handful of countries in Eastern Europe that have trimmed the size of the public sector. Bershidsky does explain that the numbers today are slightly better than they were at the peak of the economic downturn, though not because of genuine fiscal restraint. The spending-to-GDP-ratio first ballooned by 2009, exceeding 50 percent for the EU as a whole, and then shrank a little… That, however, was not the result of government’s austerity efforts: Rather, the spending didn’t go down as much as the economies collapsed, and then didn’t grow in line with the modest rebound. Here are some examples he shared. I suppose France deserves a special shout out for managing to expand the size of government between 2009 and 2013. That’s what you call real commitment to statism! The article also cites an example that is both amusing and tragic, at least in the sense that there’s no genuine seriousness about reforming hte public sector. 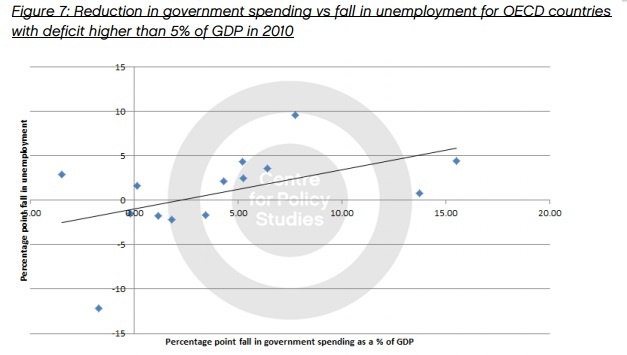 Even when spending cuts are made…, the whole public spending system’s glaring inadequacy is not affected. …The ushers at the Italian Parliament, whose job is to carry messages in their imposing gold-braided uniforms, made $181,590 a year by the time they retired, but will only make as much as $140,000 after Renzi’s courageous cut. If you wonder what on earth could be wrong with getting rid of them altogether and just using e-mail, you just don’t get European public expenditure. I particularly embrace Bershidsky’s conclusion. 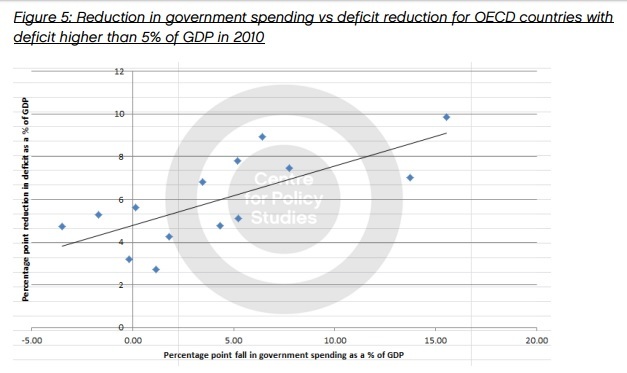 There is no rational justification for European governments to insist on higher spending levels than in 2007. The post-crisis years have shown that in Italy, and in the EU was a whole, increased reliance on government spending drives up sovereign debt but doesn’t result in commensurate growth. The idea of a fiscal multiplier of more than one — every euro spent by the government coming back as a euro plus change in growth — obviously has not worked. In fact, increased government interference in the economy, in the form of higher borrowing and spending as well as increased regulation, have led to the shrinking of private credit. 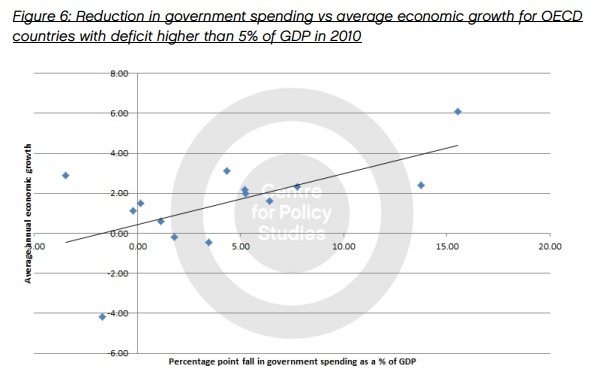 …Unreformed government spending is a hindrance, not a catalyst for growth. Politicians will never want to hear this message, but government spending undermines economic performance by diverting resources from the the economy’s productive sector. Here’s my video on the theoretical evidence against government spending. And here’s the video looking at the empirical evidence against excessive spending. P.S. Other Europeans who have correctly analyzed Europe’s spending problem include Constantin Gurdgiev and Fredrik Erixon.